It’s the clash of the titans, Apple vs. Google in the battle of the flagship smartphones, with one key difference – Google’s offering starts at £200/$300 less than Apple’s does. Find out how the two compare in our preview, where we take a look at the specs and features of each to see which is worthy of your hard-earned cash. It’s called a preview as we’ve had a limited time with the Nexus 5X so far, but we’ll be updating once we’ve used it for a longer period of time. Apple’s iPhone 6s is arguably one of the best looking smartphones on the market at the moment, with a gorgeous one-piece aluminium body and curved edges that just feels great to hold in your hand. Granted, it hasn’t changed much in terms of design since the iPhone 6, but many will argue that’s a good thing – people generally like the look and feel of the iPhone 6 and 6s, and Apple has a habit of holding back on major redesigns with ‘S’ upgrades. Google’s brand-new Nexus 5X takes a slightly different approach. Instead of boasting an aluminium body, manufacturers LG decided to opt for a matte plastic design that covers most of the outer shell. There’s a large Nexus logo on the back of the device, which some Nexus fans may be happy to hear is now silkscreened onto the device, rather than being comprised of individual letters that are inserted into the case. Though some people may be put off by the use of plastic, it’s supposed to feel ‘solid’ and premium, much like Apple’s iPhone 5c. So, how do the two flagship smartphones compare in terms of measurements? Even though the Nexus 5X has the larger display of the two phones at 5.2in compared to 4.7in, its not that much larger than the iPhone 6s. The iPhone 6s measures in at a sleek 138.3 x 67.1 x 7.1mm, while the Nexus 5X measures in at 147 x 72.6 x 7.9mm, only 8.7mm longer and 5.5mm wider, giving it a higher screen-to-body ratio than Apple’s offering. The iPhone 6s is marginally thicker than its previous generation, but the Nexus 5X still can’t compete, measuring in at 7.9mm compared to 7.1mm. It’s also worth mentioning that both the iPhone 6s and Nexus 5X suffer from a common problem; a protruding rear-facing camera. While this isn’t an issue for many people, it’ll mean both these smartphones will never perfectly ‘sit’ on a table. Thanks to the use of Series 7000 aluminium in the iPhone 6s, it’s slightly heavier than the iPhone 6 and the Nexus 5X. Series 7000 aluminium is around 60 percent more durable than standard aluminium while not adding a lot of bulk to the device, which should hopefully translate to an iPhone that doesn’t dent as easily. It weighs in at 143g, and the Nexus 5X has its plastic body to thank for its weight at 136g, making it 7g lighter than the iPhone. In terms of colours, what is available? The iPhone 6s comes in four variations; Space grey, Silver, Gold and most recently, Rose Gold. The Silver, Gold and Rose Gold variations come with a white front whereas the Space grey variation comes with a black offering. The same can’t be said for the Nexus 5X, as even though its available in either Carbon (black), Quartz (white) or Ice (blue) you’ll always have black sides and front. The Nexus 5X boasts a 1.8GHz hexa-core 64-bit Qualcomm Snapdragon 808 processor, the same processor as what’s used in LG’s flagship, the LG G4 (as well as its recently announced LG V10). The Snapdragon 808 processor is coupled with an Adreno 418 GPU and 2GB of RAM, a spec that should handle mobile gaming with ease and compete with the other 2015 flagship smartphones on the market, including the iPhone 6s. Although it has been slightly let down in terms of storage, offering only 16 or 32GB capacities with no memory card slot, compared to the 16-,64- and 128GB storage capacities offered by the iPhone 6s. The iPhone 6s boasts Apple’s own 64-bit 1.84GHz A9 chipset, that has a built-in M9 motion co-processor that allows movement and location data to be recorded without a huge drain on battery life. This is coupled with 2GB of RAM, and a PowerVR GT7600 six-core GPU which should be able to handle the latest in 3D mobile gaming, in part thanks to Apple’s Metal API that provides low-level, low-overhead hardware-accelerated graphics that makes the most of Apple’s hardware. Metal is a prime example of what’s possible when the manufacturer develops both the hardware and the software to work hand-in-hand with one another. In terms of display, as mentioned earlier, the Nexus 5X has a slightly larger 5.2in screen compared to the 4.7in offering of the iPhone 6s. In fact, the Nexus 5X has a full HD (1920×1080) LCD display with a pixel density of around 423ppi and a fingerprint and smudge-resistant oleophobic coating, which should help combat one of our touchscreen annoyances. It’s also protected by Corning’s Gorilla Glass 3. The iPhone 6s has a lower resolution (750×1334) display with a pixel density of 326ppi, almost 100ppi less than the Nexus, although it does boast the same oleophobic coating and is protected by Apple’s own Ion-strengthened glass. There is one feature of the iPhone 6s display that trumps that of the Nexus 5X, and pretty much every other flagship smartphone on sale at the moment – 3D Touch. 3D Touch is much like the force touch technology that made its debut on the Apple Watch and new MacBook earlier this year, and has the ability to detect the amount of pressure associated with a tap/press, enabling a whole new level of interactions on the iPhone. Users can force press icons on the home screen for various shortcuts including activating the selfie cam on the camera, or quickly accessing your activity on Instagram. It also allows you to ‘peek’ at information like Safari URLs and images in Messages without having to fully open them – if you do want to interact with it, just press hard to ‘pop’ the preview into full screen mode. It’s easy, simple and our favourite feature of the iPhone 6s. The iPhone 6s uses the same reversible lightning connector that has been used in all Apple products over the last few years, while the Nexus 5X offers something slightly different. Instead of opting for the standard Micro-USB like many other flagship devices, the Nexus 5X follows the same route as the OnePlus Two, boasting USB Type-C technology. USB Type-C made its debut on the MacBook earlier this year, and handles not only power input, but data and video transfer too, as well as being fully reversible like Apple’s Lightning connector. Although rare to see right now, we expect USB Type-C to become the new Micro-USB and will be featured in many other smartphones coming out over the next year. The two devices also feature fingerprint scanners, though in different places. Apple’s second generation Touch ID sensor is built into the home button, and boasts improved speed and accuracy in the iPhone 6s, making unlocking the iPhone and paying for items using Apple Pay quicker than ever before. The Nexus 5X features ‘Nexus Imprint’, a fingerprint scanner that can be used by all installed Android apps and is featured on the rear of the device, just beneath the camera. This can also be used for Android Pay, though sadly not in the UK. The Nexus 5X wins in terms of battery capacities, boasting a 2700mAh battery compared to the 1715mAh offering of the iPhone 6s. The Nexus 5X also boasts fast charging technology, a feature many hoped would also be featured in the iPhone 6s, but it sadly wasn’t the case. So, how do the cameras of the Nexus 5X and iPhone 6s compare? Apple has, for the first time since the introduction of the iPhone 4s in 2011, upped the resolution of its iPhone cameras. It now features a rear-facing 12Mp camera with 1.22µ pixels, ƒ/2.2 aperture and a larger 4608×2592 resolution, while still featuring the same phase detection autofocus and a True Tone dual-LED flash as its previous generation device. It offers various shooting modes, including a 240fps slow-mo mode, a panorama mode that supports up to 63Mp images and a time lapse mode with stabilisation. Although the iPhone 6s Plus offers Optical Image Stabilisation for both photos and videos, the iPhone 6s features Digital Image Stabilisation, which helps avoid shaky photos but won’t completely get rid of them. How does this compare to the rear-facing camera of the Nexus 5X? It has a slightly larger 12.3Mp camera with 1.55 µm pixels and ƒ/2.0 aperture, as well as a Broad-spectrum CRI-90 dual flash which should perform extremely well, especially in low-light conditions. It also features an IR laser-assisted autofocus which Google claims will instantly focus on close up objects, allowing you to perfectly capture the moment. Aside from this, it boasts 120fps slow-mo and, like the iPhone 6s, can record video in 4K @ 30fps. With regards to the front facing cameras, the two devices are very similar. Both the iPhone 6s and the Nexus 5X boast 5Mp forward facing cameras, though the Nexus has a slightly lower aperture of f/2.0, compared to the f/2.2 offering from the iPhone. 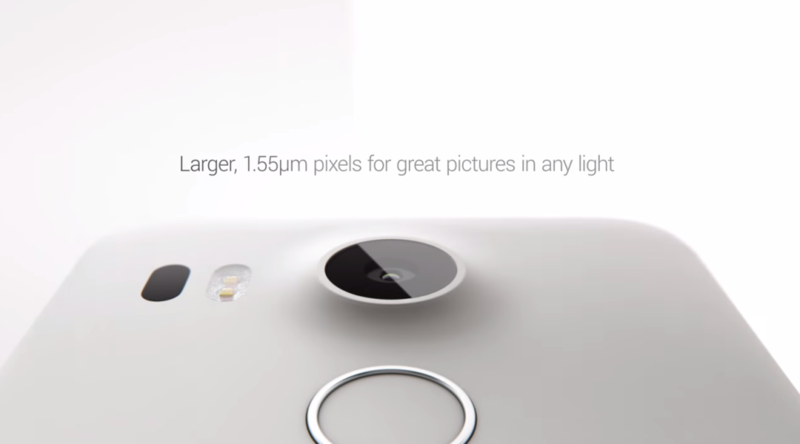 However, while the iPhone has a slightly higher aperture, the Nexus 5X boasts 1.4 µm pixels, which should bump up the quality of the images it takes, even in low-light conditions. The iPhone has a trick up its sleeve though, in the form of the Retina Flash. Instead of embedding a forward facing flash on the iPhone 6s, the company decided to make use of its bright Retina HD display to illuminate photos in the same way that its rear-facing True Tone flash does – with a variety of different levels of brightness and tone to avoid over-exposed selfies. The iPhone 6s also has Live Photos, one of the biggest selling points of the iPhone 6s and 6s Plus. The idea behind live photos is to capture something more than just a still image, and when enabled, your iPhone will not only take a photo but also a short video complete with audio, capturing 1.5 seconds before the shutter press and 1.5 seconds after, providing users with a snapshot of the moment. These photos are then ‘triggered’ by force touching the image, turning them from a static image to a GIF-like 3 second snapshot, which can also be used as ‘Live’ wallpapers on the iPhone 6s, 6s Plus and Apple Watch. The iPhone 6s comes with Apple’s latest operating system, iOS 9. iOS 9 brings with it a plethora of stability and performance enhancements, as well as a new ‘Low Power Mode’ that Android fans will be familiar with, as the feature has been available for a number od Android users for quite some time. It also brings with it ‘Proactive’, Apple’s contextually aware assistant that is said to analyse your habits and serve up shortcuts based on what it learns. Call your mum at 6pm every day? Her contact info will be readily available around that time. Always listen to music in the mornings? Plugging in your headphones will trigger a shortcut to the Music app from the lock screen. The Nexus 5X comes with the recently announced Android 6.0 Marshmallow, which brings with it improvements including a new notification banner for less-intrusive notifications (a la iOS) as well as ‘Now on Tap’. Now on Tap is Android M’s flagship feature, and is a contextually aware personal assistant reminiscent of Google Now that can be used in any supported Android app. Lets say you and your friend are discussing where to go to dinner via text, and they suggest a restaurant you’ve never heard of before. Simply activate Now on Tap by holding the home button and it’ll contextually analyse what’s on the screen and show you various pieces of information about the restaurant including opening times, reviews, etc. Plus, all Nexus 5X owners should be confident in the knowledge that it’ll always receive the latest Android M updates, which is a big deal with such a fragmented operating system. 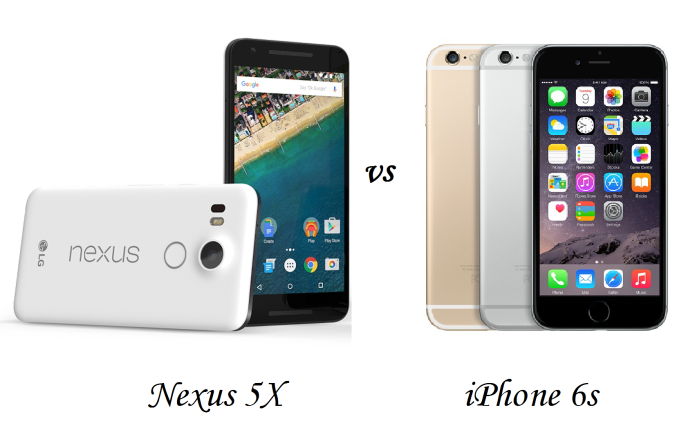 So, now you know all about the iPhone 6s and Nexus 5X, where can you buy them? At the time of writing, the Nexus 5 is available to pre-order from the Google Store, with shipping commencing around the end of October with no solid delivery date provided. The 16GB will set you back £339/$508, while the 32GB variation will set you back £40/$60 more, at £379/$569. The iPhone 6s is more expensive – in fact, its £200/$300 more expensive than its Android counterpart. The iPhone 6s is available to buy right now from both the Apple Store, and via UK mobile carriers. The 16GB variation will set you back £539/$808, while the 64GB variation costs £619/$929 and finally, the 128GB capacity will cost a whopping £699/$1,049. While both phones bring something unique to the table, we’ve got to go with the iPhone 6s on this occasion. The premium look and feel of the iPhone is great, and the addition of 3D Touch really does open up a new world of interactions on your mobile. However, if you haven’t got the budget for the iPhone 6s, the Nexus 5X can compete with the iPhone 6s in almost every category, and for £200/$300 less, it’s definitely worth considering.